Ability Fest returns for second year! Australia’s most accessible and inclusive music festival is returning for its second year next weekend, complete with an awesome lineup and Guide Dog puppy petting zoo. 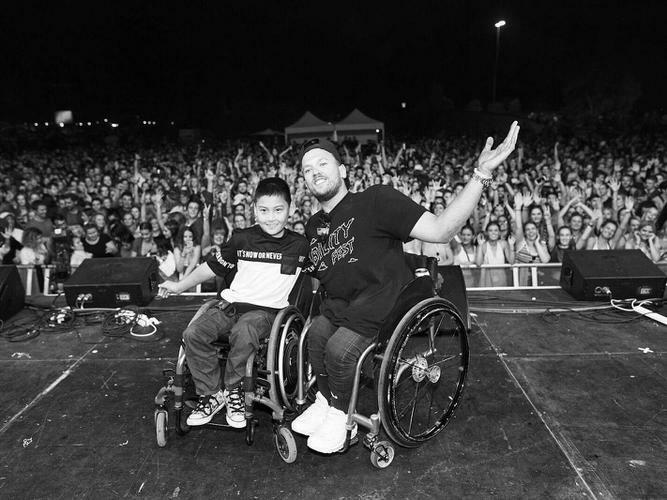 Organised by The Dylan Alcott Foundation and Untitled Group, the festival aims to make music a platform to normalise disability by encouraging everyone, regardless of disability, age, race, sexuality or gender to come together in celebration of live music. Held at Coburg Velodrome in Melbourne this Sunday, Ability Fest will feature quiet zones, viewing platforms and on-stage AUSLAN translators alongside a range of other special needs facilities. All artists, including The Presets and Hot Dub Time Machine have donated their time, with all proceeds from the festival going towards helping young Australians with disability through the Dylan Alcott Foundation. Hireup, an online disability support platform helping Australians with a disability find, hire and manage their support workers has been recruiting up to 50 volunteers to support at the festival. Melissa Benson is a disability advocate and motivational speaker living with a vision impairment and was approached by Hireup to volunteer at Ability Fest. She says she is looking forward to being “a part of something amazing”. “It [Ability Fest] enables people with special needs to be able to go to something like this and feel part of the community, part of something amazing and not feel restrained because they have special requirements. “Regardless of our differences, we are still human. With the event open to anyone, Ms Benson believes it will change people’s thoughts and she is excited to be given the opportunity to volunteer. The festival is also made possible by major partner ANZ. You can buy tickets for Ability Fest and view the full lineup here.